It's Friday and now that we're grilling out each week at work, I don't have to be there until noon. That means there's a few minutes to get on here before getting off to work. Just got off the phone with Eleanor Friedberger for a talk that will wind up in Pittsburgh City Paper to plug her show at the end of June. She was nice but kind of hard to hear because her phone was so quiet. It didn't help that the p.r. person kept picking up an extension towards the end of my allotted 15 minutes. I was tempted to keep going with some questions but that maneuver psyched me out a bit. But Eleanor got in a lot of good quotes and information within that time frame. Her new album, Personal Record, is out next Tuesday. Earlier this week, I turned in a feature to CP about the Pittsburgh Jazz Festival, which leaned heavily on Rudresh Mahanthappa, my intention. Then, I also got an assignment to talk to Chicago saxophonist Ernest Dawkins, who's here a few days before Friedberger. If that wasn't enough, I got the CP feature on Belle & Sebastian for their big show next month. I'm not wigging out over all that hanging over my head yet. I'm trying to take on more responsibility and manage everything like that, so there won't be any freaking out. Over the weekend, we're going to Ohio to visit family, and staying in a hotel room there. I'm hoping to take the laptop and maybe, just maybe start posting some reviews of albums here. For now, I have to do some research on where to get a new needle for our turntable. This week I came down with a case of laryngitis for the first time since grade school. It was kind of cool at first, until I realized that I really couldn't communicate with anyone. I left work early on Wednesday, went to MedExpress (the convenience store of medical help) and stayed home yesterday, not talking at all until about 3 o'clock. Today I'm back to work at noon. In a few minutes I hopefully will be transcribing interviews done for a preview of the Pittsburgh Jazz Live Festival that's happening in a few weekends. But most importanly..................here it comes...........THE B.A.L.L. ARTICLE IS UP ON THE BLURT WEBSITE! Check it out. I wrote really long, thinking that Fred would pare it down but it's all there. I must say I'm rather proud of it. John Vanderslice's new albums came in the mail on Thursday! I didn't know they were here until yesterday morning, by which point I was getting ready for Take Your Father To School Day, so I hate to wait all day to listen to them. Dagger Beach is Vanderslice's official new album, which he released himself. The money to do that came from a Kickstarter campaign that I donated to. One of the thank-you packages was the chance to get Dagger Beach on vinyl, along with another record, John Vanderslice Plays Diamond Dogs. So I just had to donate enough to get them. And they're both autographed, not that I seek that out but it's cool. Both albums were really great on the first listen. I'm really happy that he included a lyric sheet with Dagger Beach because when I don't have one there, I feel like I'm missing out on some important plot line in the lyrics. His last two albums didn't have one. Something's bugging me. Not sure what, so I made a drink and decided I better write a little. I can't just do CD reviews and nothing else. I'm not producing enough copy to do that. I never wrote that I interviewed both Kramer and Don Fleming last week. Not together but within an hour of each other. B.A.L.L. is having a reunion show in New York at the end of the month and when I mentioned it to my editor he said, "We've got to have a story on this." So naturally I had to be the one to write about it. 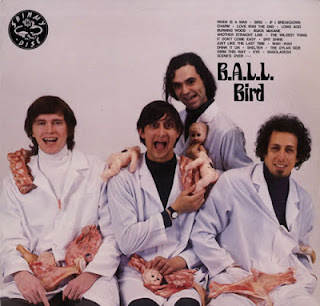 If you saw my review of Kramer's recent Brill Building album, you know how I feel about B.A.L.L. And any chance to talk to Kramer is always a good time. We talked about all kinds of stuff. What a nut. A lovable nut, that is. But it doesn't come close to their live show which was sooooooooooooo over the top. The TV on the Radio of experimental jazz? A transplant of 1968-era Soft Machine into 2013? 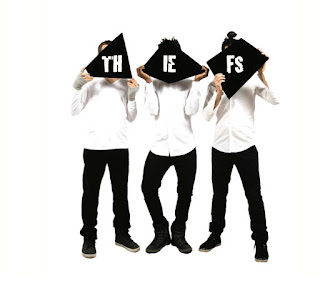 Thiefs (they meant to spell it incorrectly) can put those thoughts in your head while listening to their debut album. At least they put them in mine. One of the reasons TVOtR has endeared themselves to me relates to the way that they don't sound like anything else I've heard, combining all kinds of disparate musical elements together without inhibition. Thiefs have that same fearless quality. With former David S. Ware drummer Guillermo E. Brown in a band, it gives you certain expectations, which he and his triomates (saxophonist Christophe Panzani, bassist Keith Witty) turn on its ear. Brown likes to groove here, in some cases limiting himself to just snare and kick drum with a little hi-hat, and showing restraint ("The Actual Neef"). The album's opening sounds come from effects-heavy samples (all three are credited with "electronics" in addition to their instruments), to which Brown gradually adds real drums. This track, "Doute/s" is one of two cuts recorded live at New York's Jazz Gallery, without any post-performance additions. Further, Brown sings on a few tracks, with a strong voice that does sometimes sound like TVOtR's Tunde Adebimpe, strong in delivery and giving shape to something that seems a little loose. Melodically, though he also sounds a bit like Robert Wyatt from later in his solo career. He once sang in a neo-soul/no wave group called Pegasus Warning, which explains how he's able to take a traditional delivery and toy with it. Although Thiefs are all about setting a scene, Panzani's playing makes sure the music doesn't satisfy itself with endless riffs or loops. On tenor primarily with occasional soprano, his solos add deeper perspective to the music. Panzani occasionally runs his horn through wah-wah effects, which is where the Soft Machine comparison comes in. It recalls Mike Ratledge's keyboard sound when he used wah-wah but before he started using his signature fuzz (heard on their Volume Two album). This sound warps "Daybaby" even further, a song that combines a soul ballad, an arty melody and a lyric inspired by the impending birth of a child. Any of those elements could run the risk of flying way off track but Thieves make it work. Bassist Keith Witty adds a significant element to the mix, sonically. While it's easy to imagine a fretless bass guitar sliding all over the music, Witty sticks to an upright, which keeps the music on organic ground whether the jazz quality of their set is in full force or a trip-hop style takes over. Speaking of which, "Sans Titre (huile sur toile)" starts off like dub, with guest accordion player Vincent Peirani, magnifying that aspect of it before the coda goes off into double-time with everyone being just a touch out of sync with one another, although they still move as a unit. With all the talk that goes on about making jazz contemporary in order to appeal to non-jazz fans, the thing that always seems to get sacrificed first is the edge, found in melodies or in the "blowing" sections, which get reduced to something that's heard as the fade-out begins. That doesn't happen with Thieves. As a perfect example, "The World Without Us" also sounds like a smooth ballad, complete with gentle Brown vocals. But even with electric piano (from guest Shoko Nagal) underscoring a gentle scene and Panzani playing soprano, the saxophonist still fits in a provoking, somewhat biting solo. And they follow it with "TWWU (postlude)" which only lasts two minutes, but it's a dark, ominous two minutes, where Brown makes my Adebimpe comparison a little more credible. This is accessible and thought-provoking. On one hand, it doesn't seem right to hear a band with a flute-and-vibes instrumentation and immediately compare it to the collaborations of Eric Dolphy and Bobby Hutcherson. The latter two are great artists to evoke, but it feels like it goes for the easy description. Then again, Aquarius does just that on the back cover, amending it by saying the album gives the reference "a Chicago twist." So it's not just me. 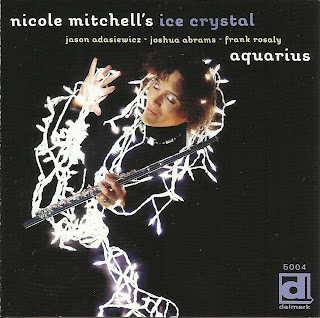 Flutist Nicole Mitchell has written for a number of bands over the last several years, including a string quartet, a project inspired by modern science fiction with intense vocals (that worked where others failed) and smaller groups. Aquarius, she says, is the first album in a while where she simply wrote tunes without an overarching concept, and as such it comes off like more of a straight ahead band with themes and solos - albeit ones that avoid anything standard in that situation. Jason Adasiewicz provides the vibes, and even he seems to be approaching his instrument a little differently than usual. Known for leaning on the sustain pedal and letting harmonies spill into each other, he keeps it dry on several of the album's early tracks, providing strong punctuation with metallic clunks. There are other moments too where he uses his instrument for dreamy textures, like "Today, Today" and "Above the Sky," using the sustain. Joshua Abrams (bass) has worked on several of Mitchell's albums and it's clear why he's her bassist of choice. Even when her writing doesn't follow a straightforward pattern, he manages to find a way to doing so solid walking behind her and Adasiewicz. His bowing on the title track sounds especially compelling, pulling out heavy double-stops, screeches and rapid lines. During that section, Frank Rosaly's percussive noises sneak up in the background, and it can be hard to tell if it's him or some noise in the next room is blending in appropriately with the disc. But that's Rosaly's skill in all of his projects, which is on display throughout the album, adding a solid backbeat to "Sunday Afternoon" or acting more pointillistic in "Diga Diga." Both situations make a strong performance. Mitchell, who relocated to California a year or two ago, still has an excellent rapport with her Chicago compatriots. Her writing feels infectious from the opening notes of "Aqua Blue" until the closing "Fred Anderson," which features Calvin Gantt doing a spoken word homage to the title subject, the saxophonist/club owner/overall guru of Chicago, who passed away in 2010. (It works because the words are direct and straightforward without getting flowery.) Aquarius may be an album of unrelated tunes, but each has a distinct personality, shifting gears after the previous one, resulting in a consistent set. While the first half gets into more free territory, with some muscular flute exclamations in the extended "Aquarius," the second half feels a little more in the pocket, while maintaining the same level of action the whole time. Mitchell talks in the liner notes about all the Chicago touchstones that have shaped her (not the least of which is tenure in the AACM). It's clear that sense of musical adventure is still part of her musical DNA.